Graduates of St. Mary’s of Notre Dame and Michigan State University (MSU), Sarah and Jay Jollay are the new Educated Farmers. 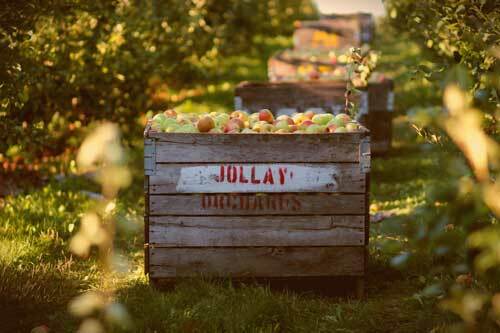 They have transformed Jollay Orchards, a 7th generation family farm, into a sustainable year-round business through innovation, creativity and social conscience. Sarah’s formation of Bainbridge Beverage Company grew out of the wholesaling of cider to local farmers markets, stores and national chains including Whole Foods through their sister company, Grandpa’s Cider Mill. Bainbridge Beverage now juices, blends and bottles fresh vegetables and fruits for many companies from start up through national distribution. Cold Pressure HPP processing is managed through their partner, American Pasteurization Company.